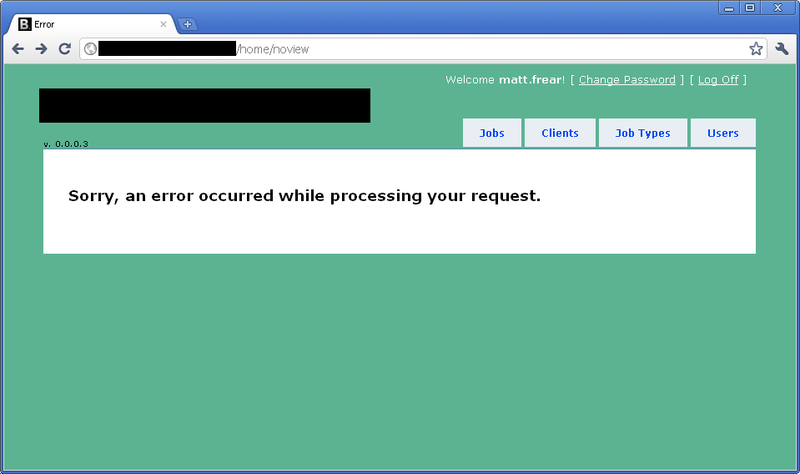 Out of the box, ASP.NET MVC3 applications have basic error handling. To see, let’s create an action that will deliberately throw an error. 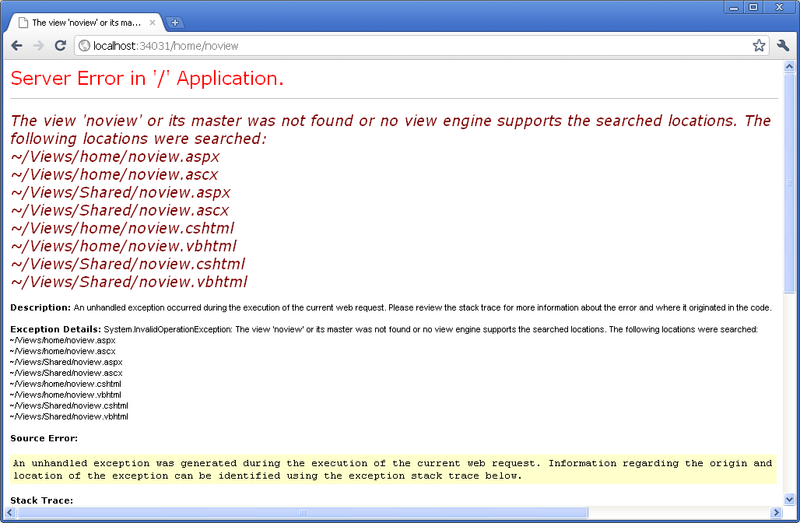 public ActionResult NoView() // this Action has no view, for testing error handling! Now when we hit /Home/NoView (in our development environment), we get the YSOD because MVC raises an InvalidOperationException, as expected. I’m not quite sure how MVC is handling the error in production under the covers, since I am NOT specifying the [HandleError] attribute anywhere. Hmm, wait a second, what’s this? In our development environment, when these exceptions are thrown they appear in the eventlog. But in production, they don’t get put into the eventlog. We need to log them somewhere! There’s a bucketload of ways to log in ASP.NET – log4net, ELMAH, etc. 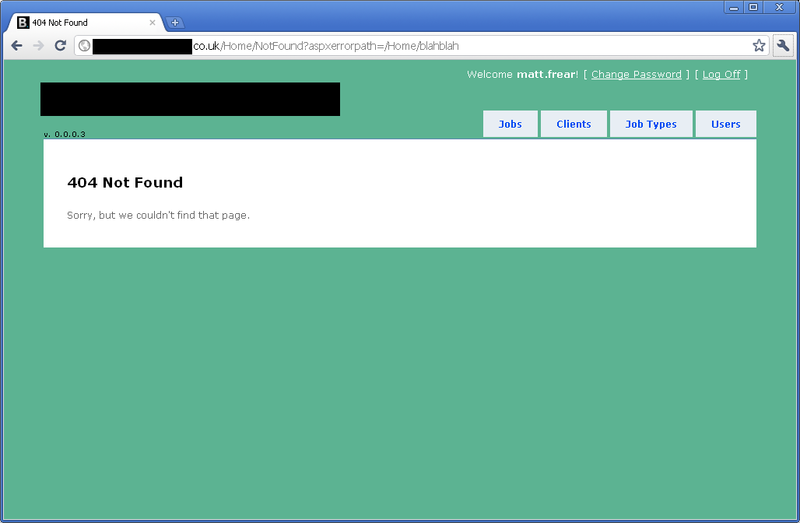 But I decided I wanted to use one that comes built into ASP.NET – health monitoring. Big success!! Our exceptions appear in the eventlog on our production web server. And now my errors are logged to my SQL database (although they’re not very readable). We don’t really want 404 errors to be handled in the same way – we should show the user a “page not found” error page instead of the generic “an error occured” page. Sorry, but we couldn't find that page. Note that in our dev environment it will still show the YSOD for 404s, but in production our users will get redirected correctly. One final note: if you follow these steps, 404s are NOT logged by health monitoring.